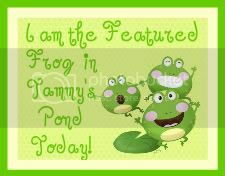 Before you start with the jokes about my many warts, Frogs = Friends on Blogs. You’ll have to see Tammy’s post for a better explanation. Hop on over and check it out! Yes, I love being pun-y. BFF will be up in the morning! We have been 'friends' for a while I think thru facebook or twitter. But anyways I read Tammy's review about you and just followed you on Google Friend connect. Anyways, just wanted to say hello! And I thought I had it rough! I love this story because its so true they absorb everything, they absorb your joy and your stress but they absorb your love and your laughter and your humor and your silliness and that is the bestest. Going to stop by now!